Queen biopic Bohemian Rhapsody triumphed at the Academy Awards Sunday night (Feb 24th) by bringing home four Oscars. The No. 1 music film of all time in the United States won for “Performance by an Actor in a Leading Role Rami Malek,” “Achievement in Film Editing,” “Achievement in Sound Editing” and “Achievement in Sound Mixing.” The film was also nominated for “Best Motion Picture of the Year” but lost to Green Book. This was Malek’s first Academy Award nomination and win. Last month, the film took home two Golden Globe awards for “Best Motion Picture (Drama),” and Rami Malek for “Best Actor Motion Picture” for his portrayal of their flamboyant frontman Freddie Mercury. Queen + Adam Lambert opened the hostless show by performing “We Will Rock You” to a standing crowd. They sat for “We Are The Champions” and stood again when a pic of Mercury was displayed on the large screen behind them at the conclusion of the performance. 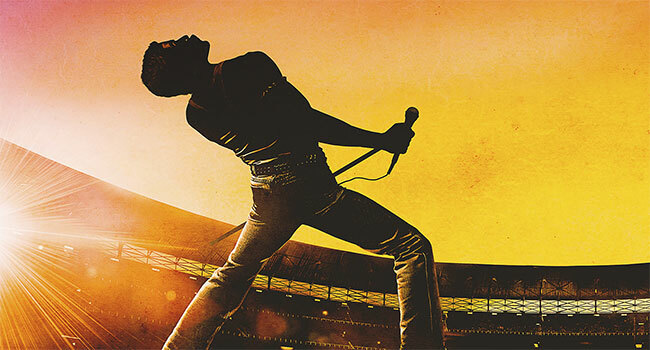 Bohemian Rhapsody, now available on 4K Ultra HD, Blu-ray and DVD, is a foot-stomping celebration of Queen, their music and their extraordinary lead singer Freddie Mercury. Mercury defied stereotypes and shattered convention to become one of the most beloved entertainers on the planet. The film traces the meteoric rise of the band through their iconic songs and revolutionary sound. They reach unparalleled success, but in an unexpected turn Freddie, surrounded by darker influences, shuns Queen in pursuit of his solo career. Having suffered greatly without the collaboration of Queen, Mercury manages to reunite with his bandmates just in time for Live Aid. While bravely facing a recent AIDS diagnosis, Mercury leads the band in one of the greatest performances in the history of rock music. Queen cements a legacy that continues to inspire outsiders, dreamers and music lovers to this day. Original band members Brian May and Roger Taylor are once again teaming up with longtime frontman Lambert on lead vocals and returning to North America this year for a 23 date tour. Produced by Live Nation, The Rhapsody Tour is set to run from mid-July through late August with an all-new concert experience. The tour follows an acclaimed run of ten sold out shows at the MGM Park Theater in Las Vegas in September 2018 and will kick off July 10th at Vancouver Rogers Arena.